The day, Tim says, provided “a primer for students, to heighten their awareness and refine their thinking in advance of going out on their first actual tours with parents.” Many times juniors will take some time during spring break to visit a few colleges that they might be interested in. By visiting college campuses with Williston college counselors, and then meeting admissions officers at those campuses, Williston’s students will better prepared to get the most out of tours they do on their own. 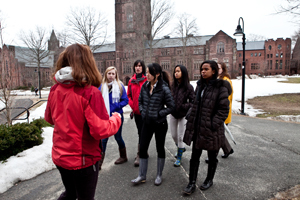 Each junior got to choose which campus he or she would visit on this trip, which was organized by the College Counseling Office, with assistance from Kim Evelti, curriculum specialist for Five College resources. The feedback on the outing has been positive, and plans are underway to make it an annual event.